^ The cards you'll be using all have asymmetrical laces. It's important aesthetically to have them all oriented the some way. It's particularly important that the Devil cards always be displayed right side up from the audience's perspective. With practice, you'll soon see how the cards have to be stored in the envelope and how they should be turned over to ensure this. When inserting the Devil card into the face-up packet, you can use the orientation of the ace on the face of the packet as a guide. This presentation involves a certain amount of exposition before the effect gets under way. I offhandedly perform a couple of flourish cuts during this patter. It fits the patter and gives the audience something to look at while they're listening. At the same time, I make a point of not doing anything with the cards during key points in the patter so the flourishes don't become a distraction. 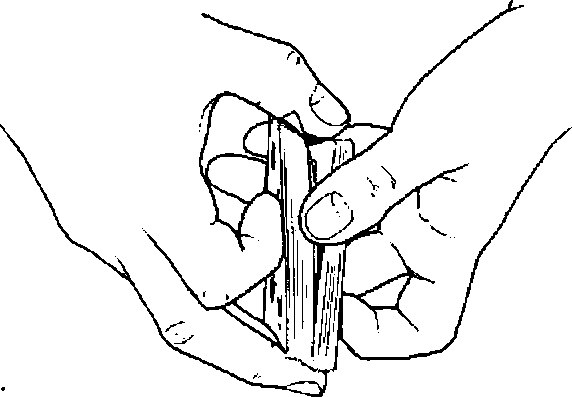 At the end of the effect, don't put the cards back in the envelope and don't put them in the same pocket as the envelope. Put them away anywhere else. You don't want to remind the audience of the handling involving putting away the wallet. It's out ol sight and out of mind. Leave it that way.